Gina just fell in love with Lucas Arruda. We first heard of Lucas Arruda in 2015 when he teamed up with the legendary Leon Ware on an incredibly soulful tune called “Melt The Night”. It was featured on Lucas’ second album “Solar”, but I only heard it on some compilation at the time. Lucas has now come up with his third album “Onda Nova” and really caught us by surprise. 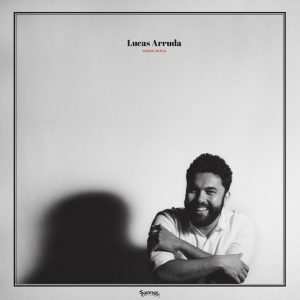 It’s like a flashback to the early 80s US soul sounds, mixed with current technology and a thunderous hybrid of Soul, Jazz, Funk, Latin, and Pop, all held together by clever songwriting, Portuguese lyrics, great production work, and Lucas’ sympathetic vocals. “Perdidos E Bobos” sounds as if Patrice Rushen from “Posh” (1980) has been transported all the way forward to 2019. Lucas wrote all of the tracks with his brother Thiago Arruda, and Gael Benyamin. On “What I’d Do For Love”, a track that is featured in both English and Portuguese versions, it’s as Hall&Oates and Michael McDonald heavily influenced the tune. The middle section comes straight out of the Steely Dan songbook. I don’t mean to accuse him of copying too many other styles and/or sounds. He actually does not. It’s just that some little things, a few notes here and there simply remind me of the glory days of the early 80s, but he truly stays unique and refreshing at all times. This is not a nostalgia-type album. The (almost) instrumental title track sports a phenomenal production and mixing work, the sound you can find on the very best Far Out Recordings by Marcos Valle or Azymuth. It’s just what we need in time for the beginning of spring: a breezy, midtempo soul/jazz groove with fancy electric keys, funky bass, and a theme which just makes you beg for more and some how a sequel to his 2015 “Uma Onda” track. Finest blue-eyed soul is back with “Heaven’s In Your Arms” where Lucas shows his versatility as a singer who also doesn’t shy away from perfectly executed pop fare à la Bill Wolfer with a composition which would have made Rod Temperton proud. The vocal arrangement on this one is brilliant. I just can’t get enough of the funky “Soulshine” and really like the schmaltzy (but with enough salt) pop ballad “Dois Náufragos”. And with pieces like the uber soulful “Depois Do Sol” with its unusual, lengthy instrumental ad lib (Ed Motta says hello on this one), Lucas once again reassures me that Portuguese is the most beautiful language of the world.